It’s hard to put an estimate on how many people are affected by motion sickness, but most people have suffered its effects at one time or another. If you’ve ever felt nauseous or dizzy after a boat, amusement park, or car ride, you’ve likely experienced motion sickness. For many of us, motion sickness goes away after we’ve reoriented ourselves (we’ll explain this later). But for those suffering from a functional vision problem, motion sickness can be an ongoing issue. Motion sickness occurs when a person experiences a wide range of symptoms, from nausea to vertigo, typically after exposure to physical, visual and/or virtual motion. In most cases, the cause of motion sickness is a mismatch between the input from the visual and vestibular (inner ear) systems. Both of these systems give the brain information about whether the person is moving, at what speed and in which direction. When this information is conflicting, the person will likely experience motion sickness. Functional vision problems can cause the visual system’s information about motion to conflict what is sensed by the vestibular system. We’ll discuss functional vision problems in more detail a bit later in the post. 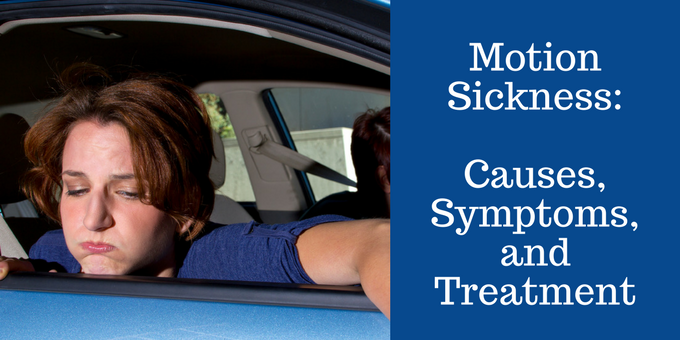 What are Motion Sickness Symptoms? “Dizziness” is an umbrella term pertaining to an uncomfortable sensation of inner confusion. In addition to vertigo, dizziness also includes common lightheadedness, equilibrium imbalance, and other common disorienting conditions. “Vertigo,” on the other hand, is a special kind of dizziness marked by a spinning sensation. You may remember spinning like a top when you were a kid, then enjoying (Yes, it was fun back then, wasn’t it?) the disorienting sensation that followed when you stopped. The spinning sensation, whether clockwise or counterclockwise, is the defining characteristic of vertigo. How Can a Functional Vision Problem Cause Motion Sickness? A person’s visual, auditory and vestibular system must be working in concert to give a person the information he or she needs to know where they are in their environment. 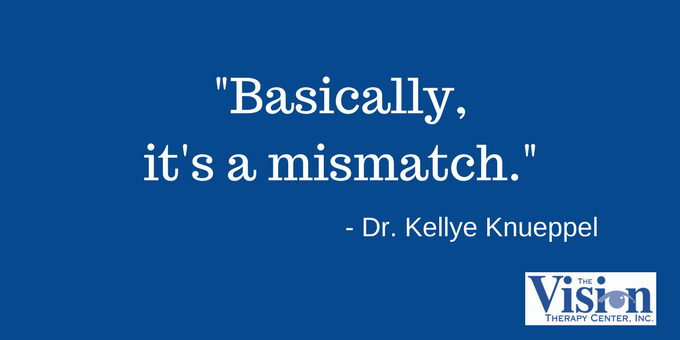 “Basically, it’s a mismatch,” said Dr. Kellye Knueppel of The Vision Therapy Center. People who have a functional vision problem, such as a problem with eye teaming, eye focusing or eye movements, have inaccurate visual information. This causes a mismatch between visual and vestibular information. When someone is in a car, for example, they rely mostly on their vision and vestibular system to tell them that they are in motion. They see themselves moving by looking out the window and they feel the motion via their vestibular system. When someone reads in the car, they are reducing the visual input of motion because they are no longer looking ahead or out the window. 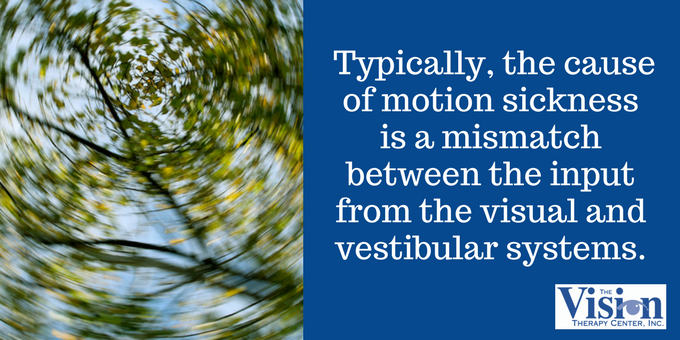 Their vestibular system says they are moving, but the visual system is not seeing it. This mismatch causes motion sickness. If you experience sea-sickness while inside a boat, it’s again because the vestibular system feels you are moving, but you have reduced visual input. When you step out onto the deck, look to the horizon, and see the boat is rocking, then the mismatch is rectified. How Long Does Motion Sickness Last? Typically the person will experience the symptom as long as there is a mismatch. When that's resolved, the symptom should resolve. For people with more serious functional vision problems, it may take longer to resolve. Is There a Motion Sickness Cure or Treatment? Any attempts to cure motion sickness start with a Functional Vision Exam. A Functional Vision Exam involves a series of tests, performed by a certified developmental optometrist, that can detect issues such as poor eye teaming, focusing, eye tracking and depth perception. 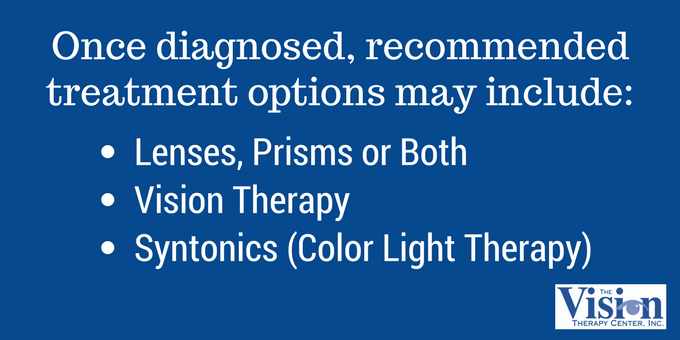 Lenses, prisms or both: We can prescribe glasses to reduce the effects of a functional vision problem. Vision therapy: Vision therapy includes a series of activities and exercises that patients perform over a period of time to improve the visual skill areas that make up functional vision. Correcting the functional vision problem involves training the entire visual system (the eyes, brain and visual pathways) to work efficiently. Syntonics (color light therapy): Poor peripheral awareness often contributes to motion sickness. Syntonics can expand a person’s awareness of their peripheral vision. If motion sickness is caused by a functional vision problem, you may find certain types of behavior (such as extensive screen time with a computer or mobile device) can exacerbate the situation. We detail some methods for reducing visual stress in this post. Are You Suffering From Symptoms of a Functional Vision Problem? Motion sickness is frequently a symptom of a functional vision problem, but there are other symptoms that may indicate you should pursue a Functional Vision Exam. Take our Vision Quiz to see if you have any of the other telltale signs of a functional vision problem.